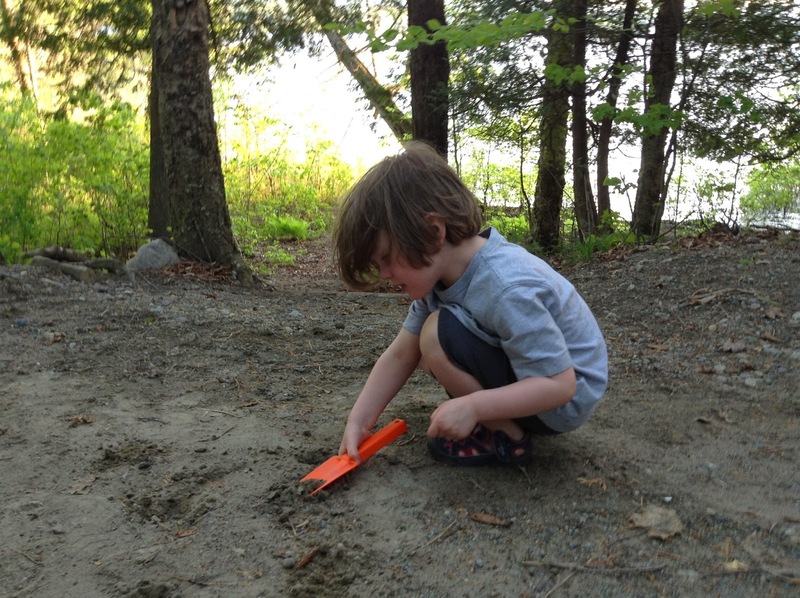 OutdoorsMom: Camping vs. Hotels: Why you should camp for your next family vacation! We did our first major family road trip this past summer and we ended up doing a combination of camping and hotel stays. Partly because there weren't campgrounds near all the areas we were visiting and partly because my husband wanted a break from camping. 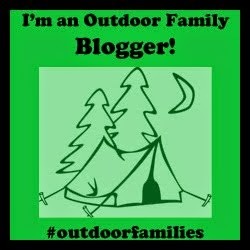 But after our experience this past summer, my husband and I both agree that camping was all around more enjoyable. 5. Floors & Outlets: Our biggest challenge with staying in hotels with a 4 and 1 year old was keeping them off the dirty floors and away from power outlets. 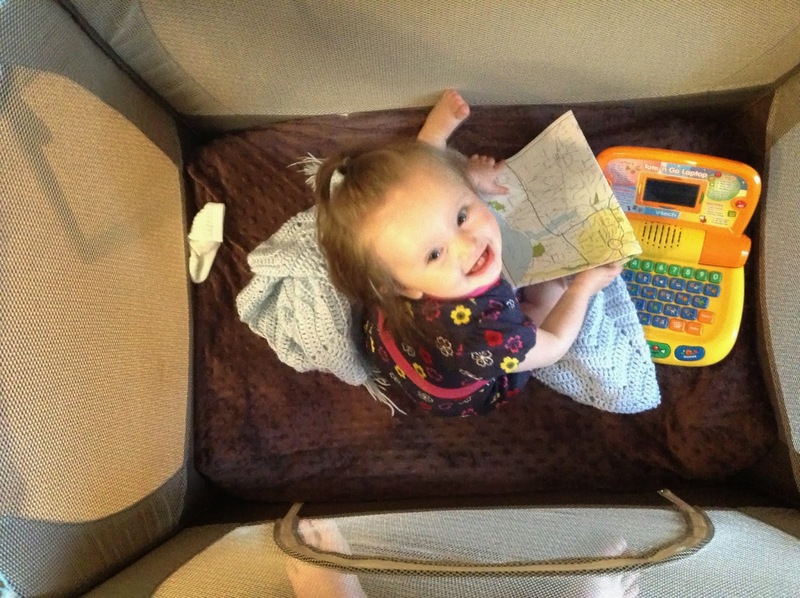 As a result my 1 year old spent most of the time in her pack-n-play or with me on the bed. Not very fun. Trust me, the smiles didn't last long. She got board very quickly. You may be thinking, "Hey, isn't camping dirty too?" Well, yes. But I would rather deal with dirt and smoke than dirty hotel room floors. Just my family's preference. One of the reasons we bought a big tent was so our kids would have a safe place to run around if the husband and I need to get work done. They love it. Plus, we always take our shoes off before we get in the tent, so I feel it is at somewhat cleaner than a hotel room floor. 4. Keep It Down: We were so much more conscious of the noise we were making when we were in hotels. Don't get me wrong, we always try to be respectful when camping and keep our noise down but campers tend expect some noise and to see kids running around playing. 3. All That Energy: There are so many more outlets for all the pent up energy from traveling. What is there to do in a hotel room besides watch TV or swim? It is just part of camping to have lots of running around space and things to discover. 2. $$$$$$$: Whether you are trying to get pent up energy out, eating or paying the bill; camping is just all around cheaper. It is certainly harder, although not impossible, to find cheap or no cost activities in the city. Last year we were able to find camp meals that didn't require a dutch oven or stove and we loved them. At hotels you generally have to pay a little more for a room with a kitchenette. Bonus: when camping there is always room and time for s'mores. 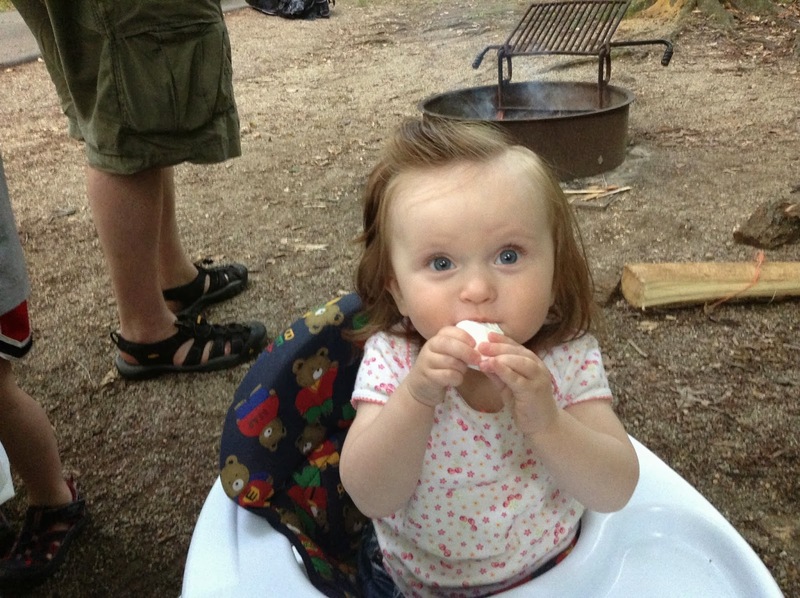 My daughters fist experience with marshmallows. Finally, it is just cheaper to camp than to stay in a hotel room. I would guess, although I haven't experienced this, is it still cheaper even if you have to rent gear. 1. Bring On The Fun: We just had more fun camping. We spent more time playing with each other and less time with electronics. Even thought it is a lot of work setting up and taking down camp, cooking meals and such, working together was just fun and it creates stronger family bonds. Even during the frustrating times. 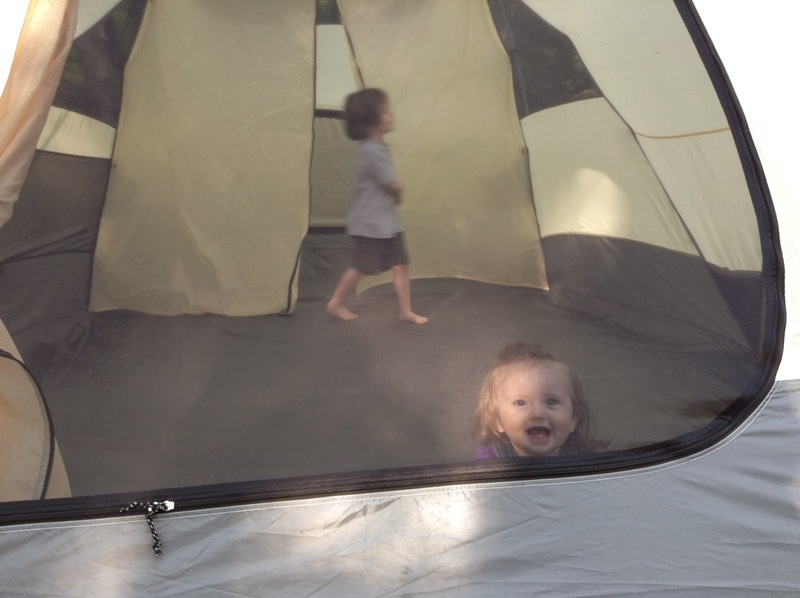 Some of our favorite time was playing in the tent just before bed. We are already starting to plan our road trip for this coming summer and we are planning on camping. And very much looking forward to it. 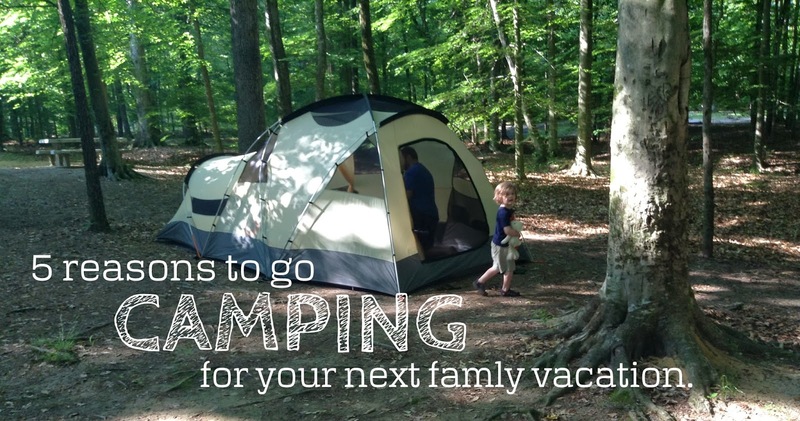 Why does your family like to camp and what benefits have you seen from that time spent together? Disclosure: I am extremely biased. I have always loved camping. But my husband is not. He actually doesn't like the outdoors much. So if he prefers camping, it must be good. I will say that our biggest frustration was dealing with all the equipment. But we found ways to cut the amount of equipment and brought equipment with multiple uses. But check out our car. 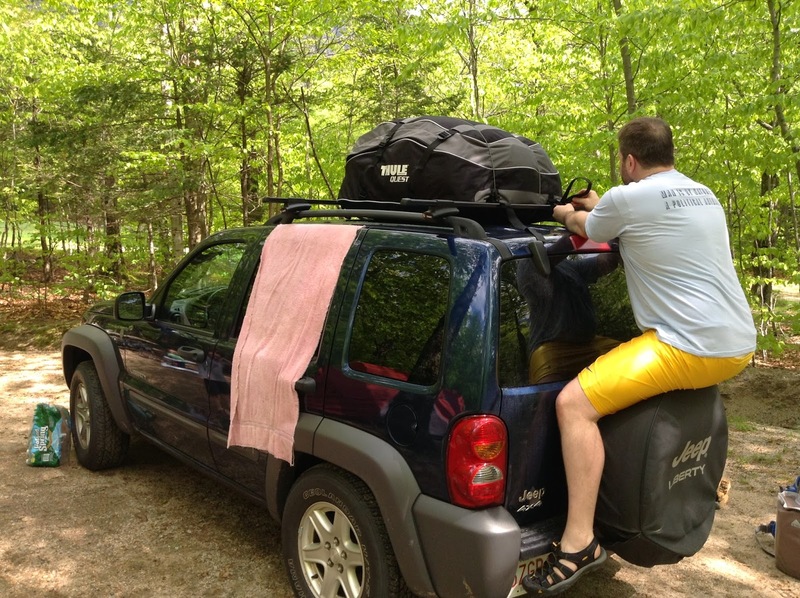 My husband strapping our cargo bag to the roof. He must really love me. *If you like this post, enter your email address in the subscription box on the right (and towards the top) and new posts will be delivered to your inbox.